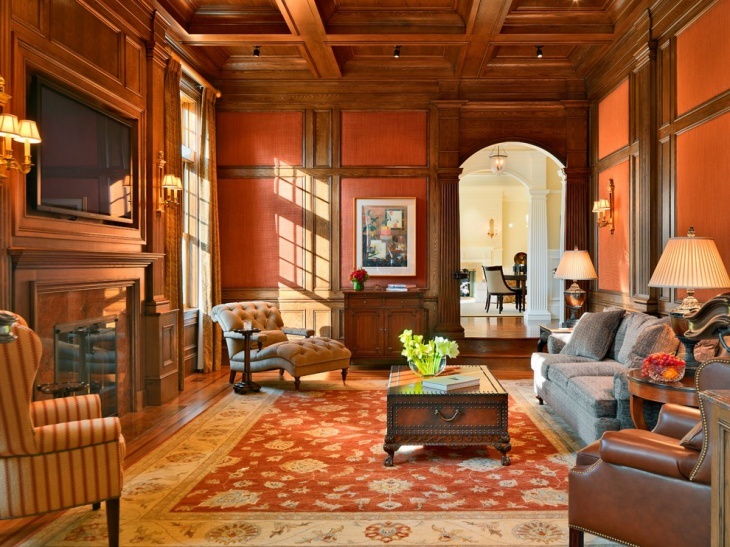 Ceilings have much more to offer than their functional value in a house. They can be customized to get stunning interiors. Among the different artistic varieties of ceiling, Wood Panel Ceiling design ideas are outstanding and innovative. They are elegant in look, and can be used in a number of living areas. You may have a perfectly designed Dining Room ceiling, bedroom ceiling, living room ceiling and so on, so as to yield the true beauty of your home. 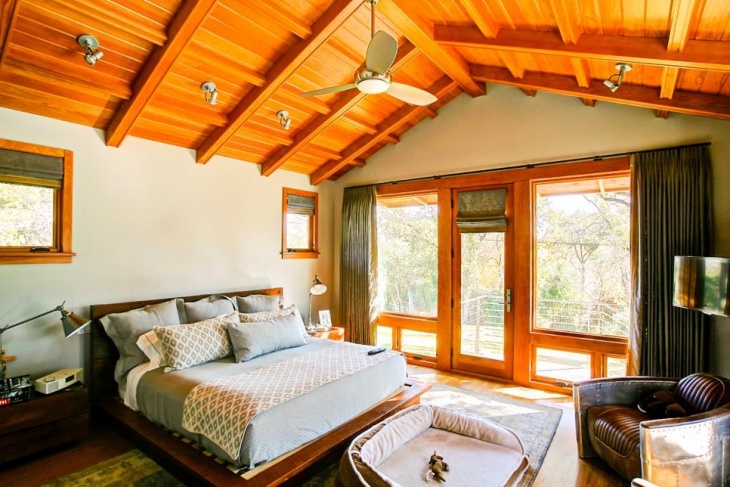 Here are ten classy wood panel ceiling design ideas that you will find interesting. Houses with rooms in the basement can opt for a wood panel drop ceiling that resembles square tiles. This matches well with the vertical stripe design of the walls and vinyl plank flooring in the room. 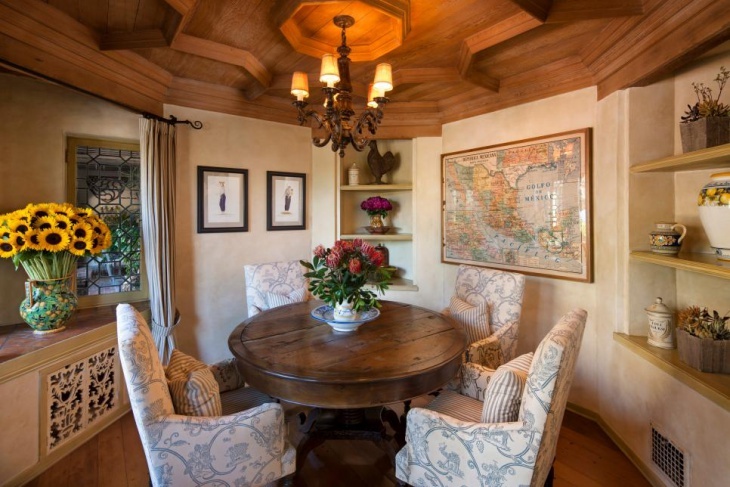 For a better look, fix small pendant lights in the wood panels in the ceiling. Modern houses with faux brick panelling in the walls need a fitting top. So, the bests option is to go for a faux wood panel ceiling. You can incorporate the dark brown flooring idea with this setting and matching furniture makes the place elegant. You can go for white covers for sofas and chairs in this case. The entrance of a house need to be elegant, so in many parts of the world the wood panel basement ceiling is growing in popularity. 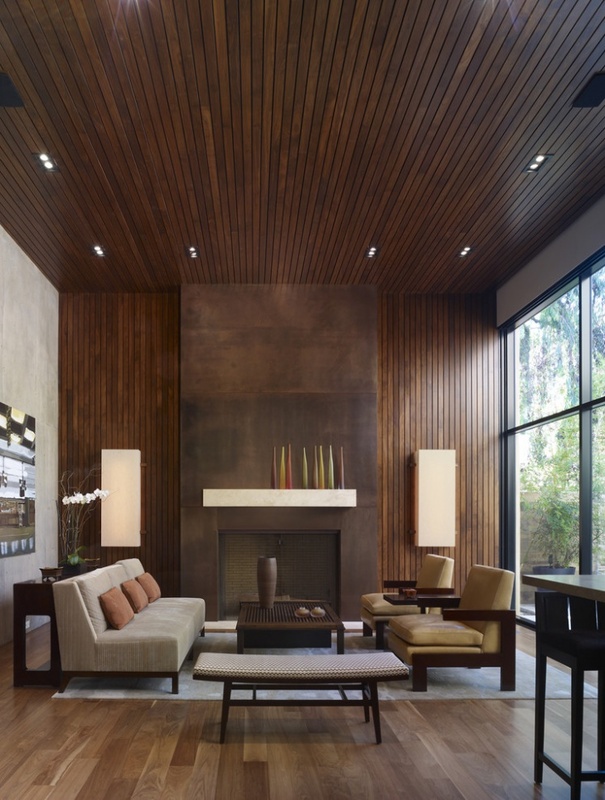 With sliding glass wood doors and matching curtains, this type of ceiling looks compatible and the dark and light contrast creates an excellent interior. 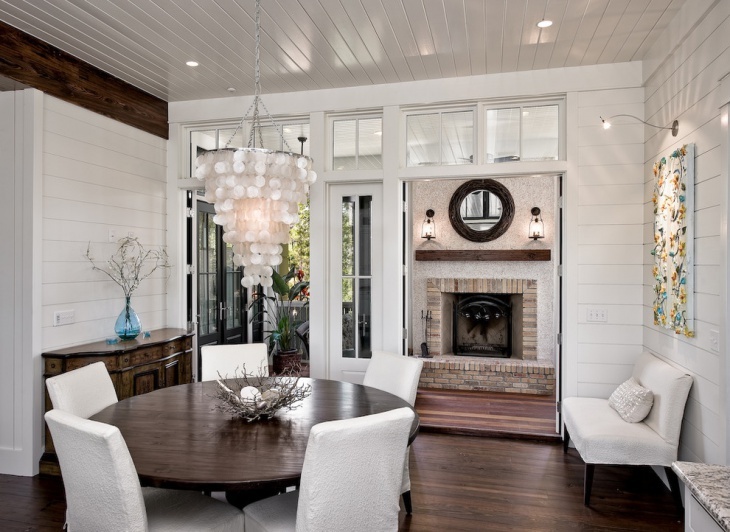 Small pendant lights on the ceiling will further enhance the look of the room. 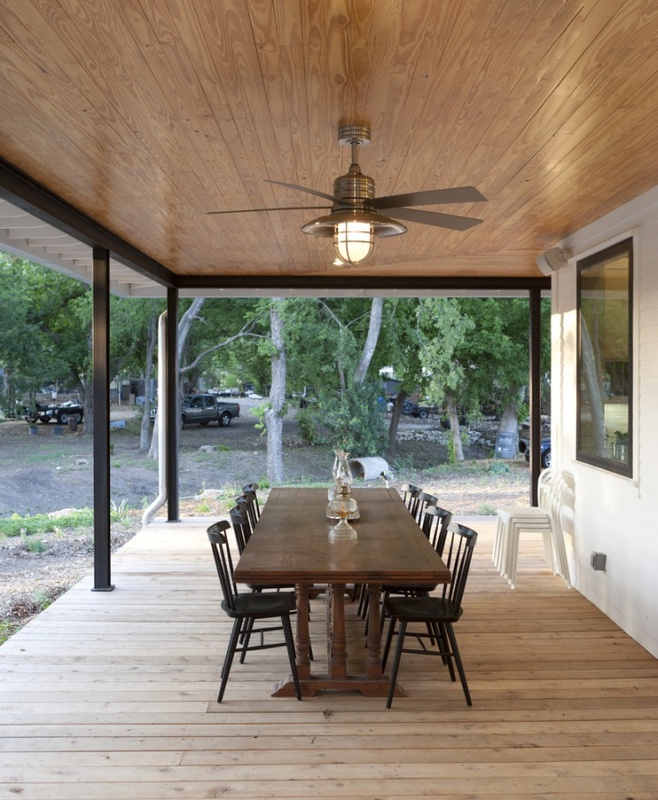 In outdoor porches built on a raised platform, the ceilings and floors need to enjoy a good compatibility. Here, you can have the same reddish-brown colour for the wood panel porch ceiling and floor. Opt for dark brown frames around the glass walls and dark coloured furniture to strike a good contrast. A nautical ceiling fan fits the room well. 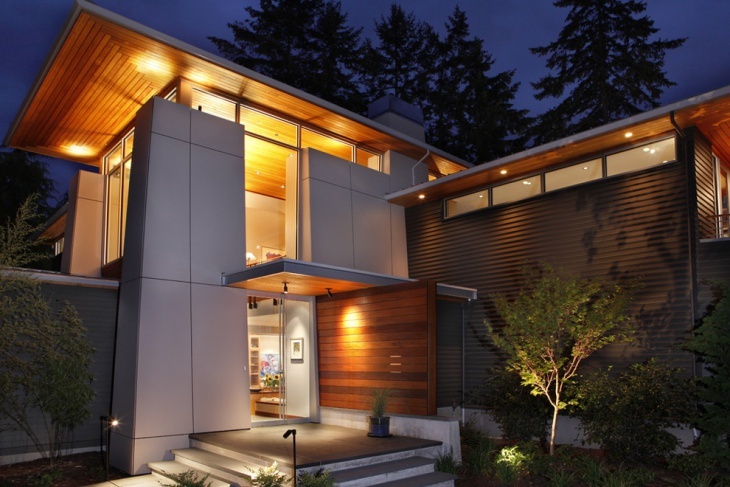 In fashionable houses of modern times, overhanging roofs have become quite popular. 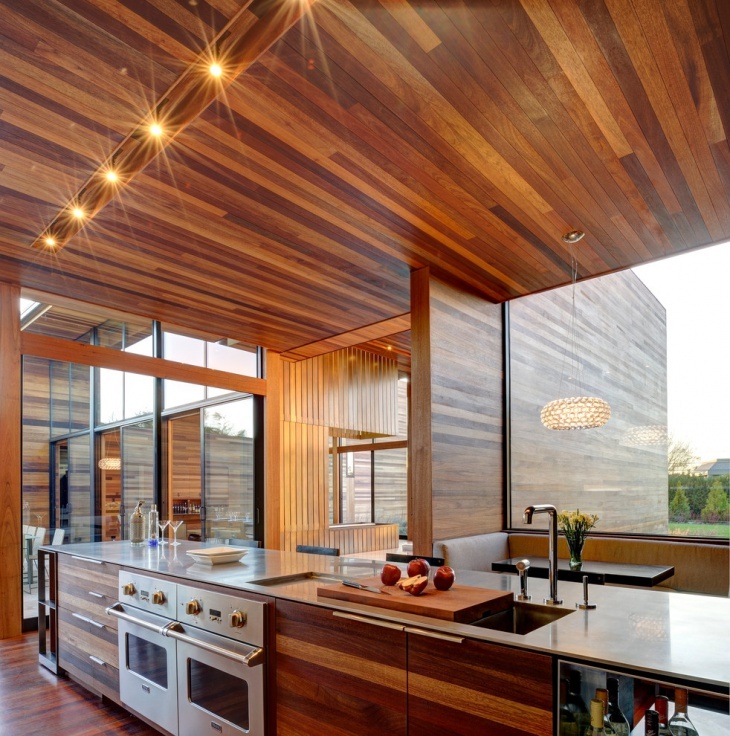 You can intensify the beauty of your house by incorporating the exterior wood panel ceiling idea. The brown colour complements the wood sidings outside the house. 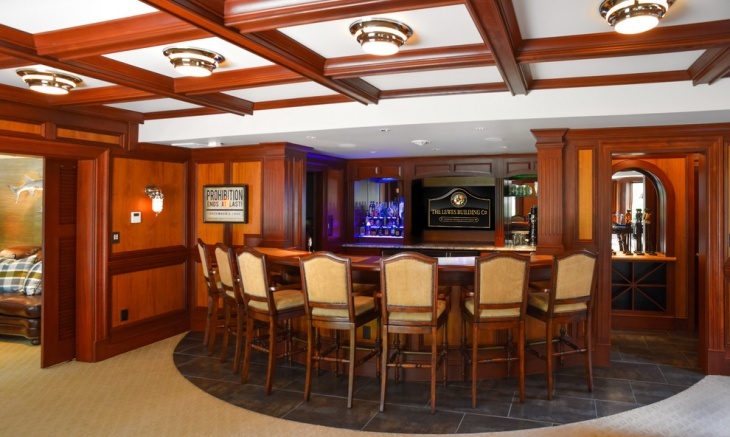 Houses with bars in the basement look sophisticated with wood panel raised ceilings. 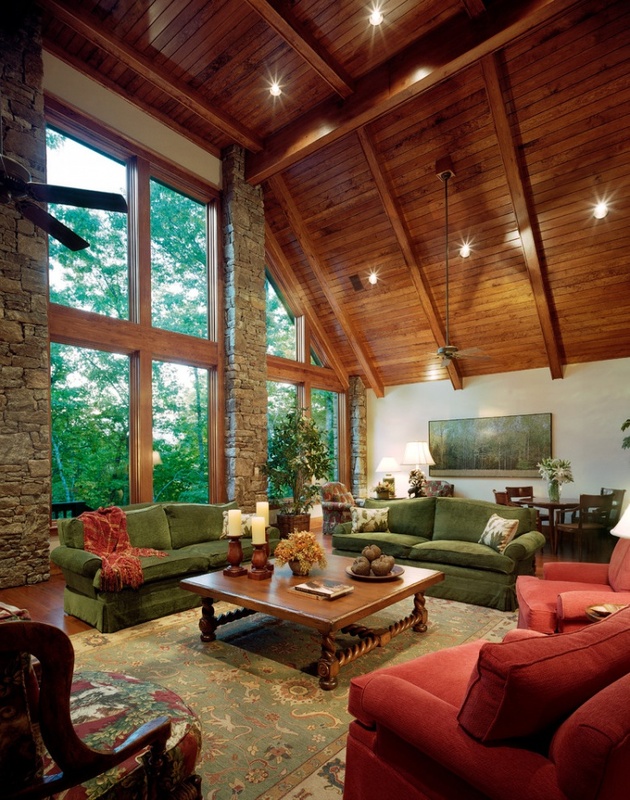 Here, wooden beams intersect each other and you can opt for circular ceiling lights in the centre. It goes well with the dark and light contrast of the wooden doors and furniture in the interior. 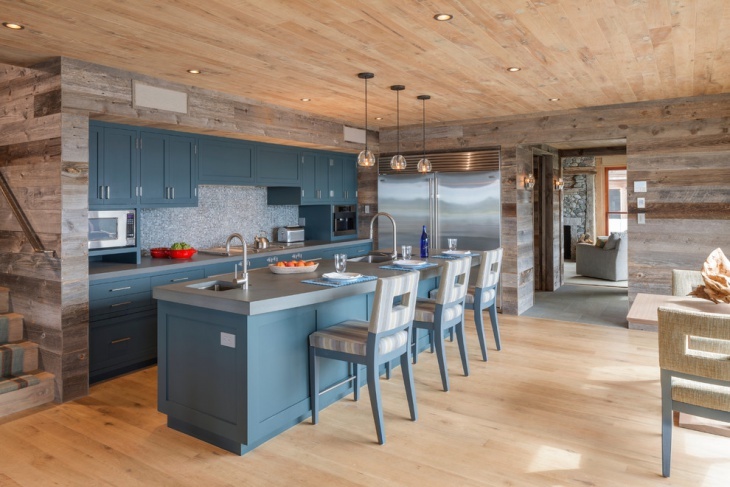 Kitchens with a glass and wood combination looks classy with bright golden-yellow pendant lights illuminating the interior. You can opt for an integrated sink for this particular setting. 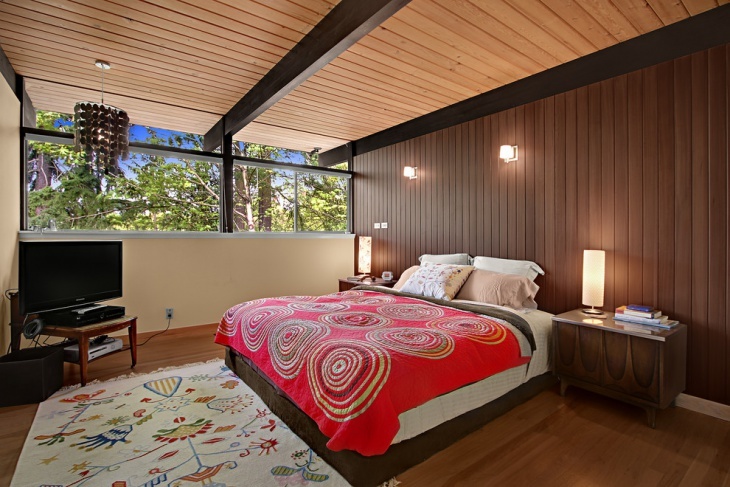 The wooden ceiling panels look matching with the interior frames of the house. Wood, stone and Glass Wall Panel finds their right incorporation in a drawing room when you have red and green couches in the room. The timber ceiling remains suspended over the rooms with rock columns tiny pendant lights makes the drawing room perfect. 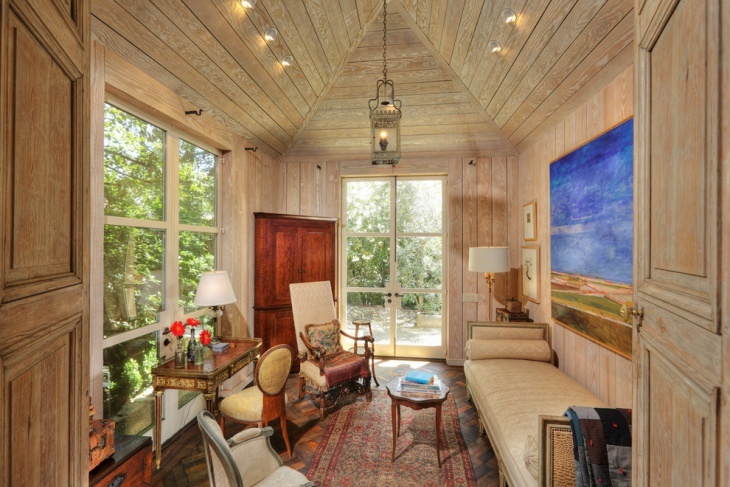 Gorgeous rooms with thin strips of wood in the ceiling look decent and appealing. In this particular setting, you can opt for the same dark brown design for the front wall. It goes well with the dark wooden furniture and wooden frames in the room. Tiny pendant lights in the ceiling are ideal for the ceiling. 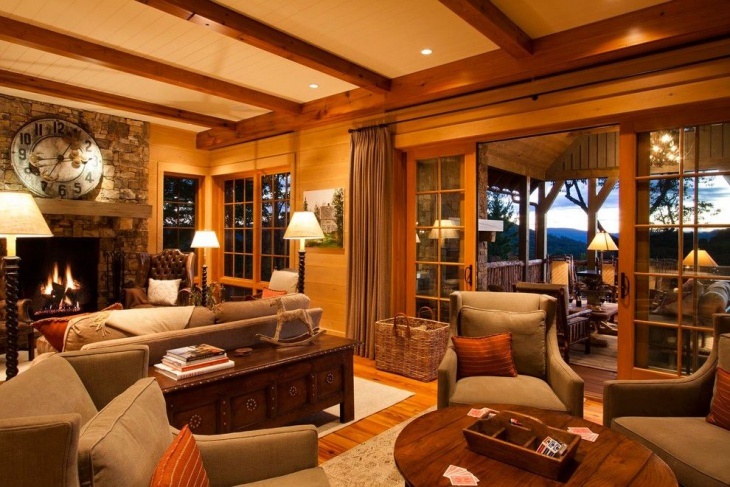 Thus, you will find several variations of the Wood Panel Ceiling in your room. A perfect Living Room False Ceiling delivers an elegant look to the house, and when you are able to achieve a compatibility with the other elements of the interior, you yield the right ambiance. 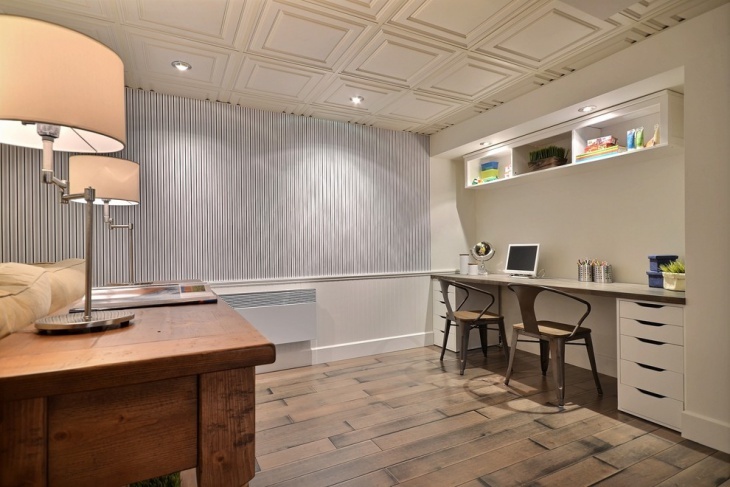 Apart from all these ideas, you may come up with innovative wood panel ceiling ideas. Feel free to share them with us.